Sweet Sixteen Apple (Malus pumila) was developed at the University of Minnesota from a cross between Malinda and Northern Spy Apples. Sweet Sixteen Apple is a late blooming tree suitable for areas with late spring frosts. It is cold hardy to -50 degrees F and is Fire Blight resistant. Sweet Sixteen Apple needs another nearby apple of a different variety for pollination. Sweet Sixteen Apple produces a medium sized conical fruit with red striping. Fruit ripens in September. 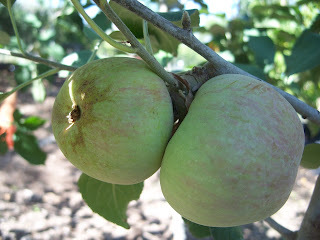 Photo below shows an immature Sweet Sixteen Apple. The fruit is crisp and firm with high sugar content. Sweet Sixteen Apple is used for cooking and fresh eating. It is sometimes described as cherry candy or nutty flavored. Fruit will keep for two months in cool storage. Apple trees need regular water for good fruit production and growth. Trees That Please Nursery has Sweet Sixteen Apples available on M111 rootstock. M111 rootstock is a very vigorous semi-dwarf rootstock. Apple trees grown on M111 rootstock grow well on both clay and sandy soils and can be kept to any desired height with summer pruning.